April is cruel, all right, but meteorology can't explain why the top block of Church Street currently looks more like poor Plattsburgh than boomtown Burlington. 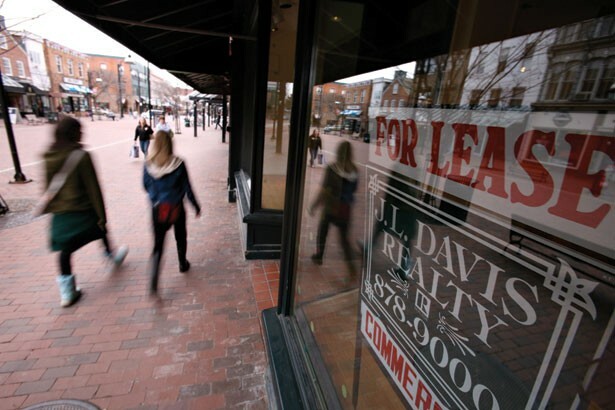 The 6500 square feet recently vacated by Ann Taylor, which has closed 117 stores nationwide, is not the only empty or ailing storefront on the northernmost stretch of the pedestrian mall. Adrianas has been empty since last year. Right next door, J. Lemay cleared out at the end of March because the owner says she "saw the writing on the wall." Across the street, North Country Books is in the midst of a going-out-of-business sale, and the space occupied by Olympia Sports is for lease. Last month, there was even talk of Borders Books & Music putting itself on the market. "It's kind of frightening," says Debbie LaFramboise of Sewly Yours, the bridal shop across from the empty Ann Taylor space. Although she just had a banner year - more brides than ever - LaFramboise says people are "making different choices," whether by opting for a more affordable wedding gown or bringing a brown-bag lunch downtown. The Peace & Justice Store, sandwiched between Adrianas and J. Lemay, is also doing well. But, "Oh, my God" is how Manager Kathy Bouton responds to the commercial casualties around her. "It's hard to know what's causing all this." High rents? Recession? Williston? The cyclical nature of retail economics? Whatever the reason for the concentration of empty storefronts, Church Street Marketplace Director Ron Redmond cautions, "Just because a business closed on Church Street doesn't mean we're in a death spiral." The top block of Church Street has always been a challenging retail environment. It's never attracted the volume of foot traffic enjoyed by the stretch of stores between College and Cherry streets. Even the lower block of Church, which has only been closed to cars since 2004, has more life - mostly nightlife - than the other end. Despite the business generated by Ben & Jerry's, and a fountain designed to draw people to the top block, "There's always been some sort of stigma to it," says J. Lemay's Patty Lesage, who is in the process of securing a new space for her store in Burlington, off Church Street. "I've seen people come up, and they get as far as Bertha Church, maybe a little further. They glance up and then they'll turn around and leave. I feel like running out my door, flagging them down and saying, 'There are more stores up there.'" Those businesses that have hung in on the top block tend to be destination-oriented: Sewly Yours, Le Zot Camera, Bertha Church, P & J, Tina's Home Designs. Conversely, retailers that rely on a steady stream of impulse buyers, such as Banana Republic, have left the top block for points south. There's no consensus among top-block retailers about what it would take to breathe new life into that stretch of Church Street. Bouton calls for more really good restaurants and food vendors. LaFramboise would love to see "something big, like a Pottery Barn or a Crate & Barrel." Lesage says, "I've always thought they need to bring something younger. If they had a Gap, or an Abercrombie, do you know how many people that would drag down to that end?" Everyone has high hopes for the new business going into Adrianas. Landlord Jeff Nick won't say who or what it is - only that it's not a food venture and is "just what the top block needs." Redmond won't name names, either. But he's more than willing to discuss other planned improvements that would benefit the top block, including moving the "transit station" to Pearl Street; adding kid-friendly features to the fountain; and raising the street grade at Cherry Street to create curb-free connectivity between blocks. "You'd be surprised how that affects shopper psychology," Redmond says. The Marketplace is also looking at public art to draw shoppers north. When it's completed, a statue of the late bluesman Big Joe Burrell will live in front of Halvorson's, where he used to play. Redmond wants to build games into the Marketplace's infrastructure, wherever possible, and is considering a life-sized chess set for the street. Lesage couldn't wait for all that. She decided not to renew her lease at 23 Church at the end of March because she knew Ann Taylor planned to close. It was a preemptive move that surprised her neighbors. "Where I was situated in the middle of the block, I relied a lot on the people going up to Ann Taylor," she explains. Lesage had designs on the former Learning Express space, but the deal fell apart. So, she's decided to move J. Lemay next to Skinny Pancake on the Burlington Waterfront. "Quite frankly," she explains, "it's cheaper rent." Price is a definite factor in this economy, but so far Church Street still has plenty of takers, according to Redmond. "Whenever there's a vacancy on Church Street, a long line forms," Redmond relates. "Granted, we're headed for tough times, but we continue to be a place people want to come [to]." National chains checking out the market "are amazed at the foot traffic we have. The vitality of downtown - they really like it." Those nationals, which account for 40 percent of Church Street's retailers, have advantages over their local competitors: They can sign longer leases and pay higher rents. But they'll be more exposed if, as many economists expect, the country slips into a recession. "A local business has a lot more control," Redmond says. "We've got CEDO. We've got great local banks. We've got things in place to help our local businesses succeed." Canadian shoppers might bolster Burlington's bottom line, but no quantity of loonies, it seems, could save Ann Taylor.